“Emotional Residue” is the idea that emotions leave traces in the physical environment, which can later be sensed by other people. In this way, some places are thought to become sacred or malevolent, happy or etched with sorrow. A variant of emotional residue, more palatable for the skeptics, is Meaningful Residue; wherein, the emotional imprint of a particular place is contingent on knowing its story – which then directs one’s emotional experience. Personally, I believe in emotional residue – meaningful or otherwise – and I bring up it up because there is a town in Poland that has one of the strongest emotional imprints I have ever come across; one that is both full of anguish and beautifully sweet. That town is Kazimierz and the emotional residue I speak of has been captured in the photographic work of Richard Tuschman. Kazimierz was once an island, situated in the middle of the Vistula river, south of Krakow. It was called different things, but in 1335, King Casimir III (1310 – 1370) – also known as The Great – called it Kazimierz, after himself. He thought it would be a fine spot for a university, which he envisaged would bring glory to Poland. Jagiellonian University, as it came to be known, did indeed bring glory to Poland – with the likes of Copernicus etc. – but not from Kazimierz. Rather, in 1399 King Vladislaus Jagiello (c1352 – 1434) began building the university within the walls of Krakow’s Old Town; in an area that was populated by Krakow’s Jews, who were encouraged to leave as the university expanded. In 1495, amid growing religious intolerance and mercantile jealousy – and fire having destroyed much of the Jewish quarter the previous year – the Jews were officially expelled from Krakow proper and forced to relocate to nearby Kazimierz. Kazimierz & Krakow 15th century. It was poetic that Jews came to live in a town called Kazimierz; for its namesake, Casimir the Great, was considered a great friend of the Jews – granting them unprecedented rights and protection; which, unfortunately, his successors did not always uphold. Also, popular legend has it that Casimir was madly in love with a nice Jewish girl called Esther, the daughter of a poor tailor. It was a profound love – tender and enduring; remnants of which remain in the names of streets and monuments in Krakow. The re-settlement in Kazimierz came on the eve of the Golden Age of Polish Jewry, which lasted well into the 17th century; and, though unique, was part of the intellectual flowering experienced by both Poland and Europe as a whole. Central to the Jewish Golden Age was the Yeshiva system, which fostered the maturation of Talmudic scholarship. Kazimierz, the site of Poland’s first Yeshiva, set up by Rabbi Ya’akov Pollak c1509, was, for a time, the cultural and spiritual center for Jewish life in Poland. The part of Kazimierz settled by Jews came to be known as Oppidum Judaeorum, or Jewish Town. Although only 1/5 of the total area of Kazimierz, its Jewish residents came to make up nearly ½ of its total population and, nowadays, is the area typically associated with the name Kazimierz. Walls around Jewish Town were built in 1553 and expanded in 1608, at the request of the Jewish Kahal (Community Council) – whose further request to make the town Christian-free was granted in 1568. Within those walls a remarkable community flourished and declined and was ultimately destroyed; a community steeped in tradition and renowned for its religious devotion. Kazimierz was home a number of Jewish notables whose work, teaching and influence reverberates still. Like Chief Rabbi and philosopher Mosheh Isserles (c1520 – 1572) – also known as Remu – famed for his Talmudic scholarship and writings; or, Natan Nata Spiro (1585-1633), who was responsible for spreading the teachings of Kabbalist luminary Isaac Luria throughout Poland; or the indomitable Sarah Schenirer (1883 – 1935), founder of Bais Ya’akov – an education system for orthodox girls, the model of which is still used today. But mostly, it was home to ordinary men and women who lived and moved and etched lives amid its tightly packed houses, beneath the heavy mantle of religious observance. In the late 1700’s the northern branch of the Vistula river was filled in, joining Kazimierz with Krakow proper, revoking its independence. Having long since waned in glory, the majority of Krakow’s wealthy and liberal minded Jews moved out of Kazimierz, leaving the poor and fiercely religious. Book sellers, tailors and cobblers eked out a living, the synagogues and prayer houses full; woman gave birth and kept Shabbos and children learned of hunger and Talmud. And so it remained until the eve of the second world war. Kazimierz’s poor and religious did not survive the Holocaust; theirs are lives lost forever because there are none to recount their secret histories. As you walk the streets of Kazimierz, you can taste the loss and the holiness and the silence of anguish. It fixes in the mind and burrows deep in the heart, yearning for expression. 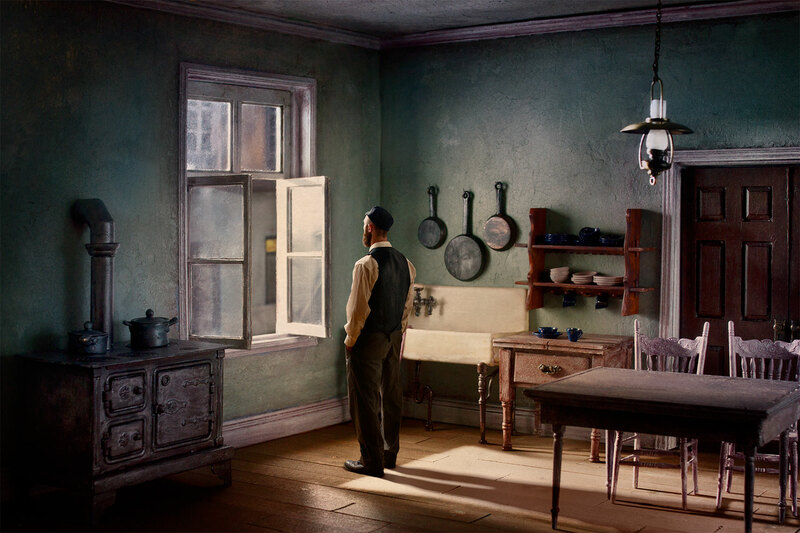 Nowhere is that expression more beautifully rendered than in the work of Richard Tuschman. The process by which Tuschamn makes his pictures is as fascinating as the outcome; he is an artist with a painstaking method which lends each picture an aura of mastery. A visit to his website reveals that process; knowledge of which adds to, rather than lessens, the delight of the finished pictures. Equally rewarding is the promotional video (below) for Once Upon a Time in Kazimierz, where Tuschamn talks about his inspiration, family connection to Kazimierz and, of course, the work itself. It has been pleasure spending time with Tuschman’s work, I sincerely love it. He himself is a gentleman and is most definitely on my list of favourite artists.